Total Score: 8.33 - ULTIMATE ENTHUSIAST AWARD! 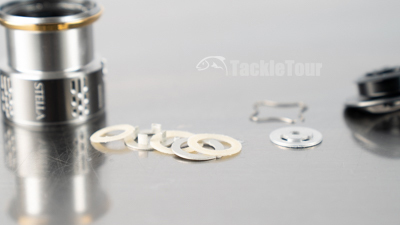 Introduction: When I joined the staff here at TackleTour back in 2004, my primary concentration was on higher end tackle. Zander coined the phrase "Enthusiast Tackle" to describe my area of concentration. Most of my purchases were products made for the Japanese Domestic Market - hence the term JDM was introduced to the fishing world. As the years have progressed, and with manufacturers finally wising up by moving towards globalized product catalogs, my duties broadened to include more affordable tackle product so now I test, fish, and write about the entire gamut. Yes, I really did give an Editor's Choice Award to a $99 reel earlier this year! 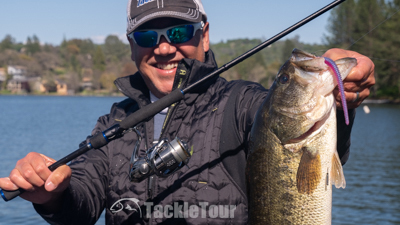 It's become increasingly difficult to find fishing tackle that ignites the enthusiast within. However, anyone who truly knows me knows my heart, my passion for fishing gear lies in the high end. It's not a matter of worth, or getting the job done, it's a matter of appreciating that time you get to spend on the water and doing so with gear that delivers that undeniable, youthful joy of your very first combo. 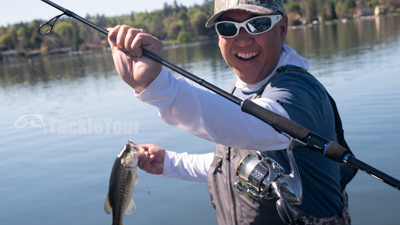 How excited were you and how much anticipation did you have to take to the water and make your first cast? Remember that feeling? That's what being an enthusiast is all about - enthusiasm. So when that piece of tackle does arrive, it deserves a bit of notoriety. Unfortunately, like anything else, too much of a good thing can make you a bit jaded and it's not long before that euphoric high grows more and more difficult to achieve. 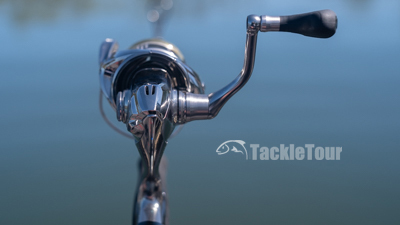 Here at TackleTour that curve is exacerbated from the sheer amount of gear we see each and every year, so when that piece of tackle arrives that can truly hold my interest for more than a handful of casts, that product deserves a bit of notoriety. Yes, it's true, I am no longer exclusively the Enthusiast Tackle Editor here at TT and have the responsibility to test, fish, and write about a wide range of tackle now. So when I get the opportunity to return to my roots, and play with something truly special, you're going to hear about it. This year, Shimano refreshed their flagship, or as Zander likes to refer to them, their "halo" spinning reel product, the Stella. Here now is our look at the new for 2018 Stella FJ. The C3000MHG FJ is a JDM model, with the only real difference being its shallow spool. Impressions: The Stella FJ is available in any number of sizes from 1000 on up to 5000. The mechanics, inner workings, fit, and finish for all these models are the same, but their sizes and spool capacities are all different - just like with any spinning reel lineup. I of course, ordered one from the JDM because I prefer fishing a larger spool (for better line management) with minimal line capacity so I don't waste spooling four hundred yards of high end four pound test fluorocarbon when I only need a little over one hundred. The model I fished is the C3000MHG rated with a spool that holds 120 yards of typical eight pound test line. The C3000MHG rated with a spool that holds 120 yards of typical eight pound test line. 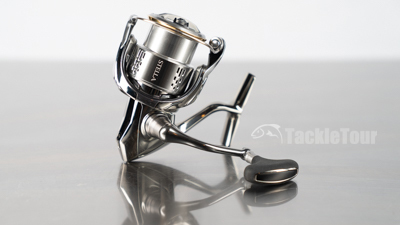 Previous generation Stella reels featured two or three different colors throughout the body, rotor and spool. The new Stella FJ is all one color - a kind of satin pewter. There are very few sharp edges on this reel. Instead, the 18 Stella features elegant, rounded contours that give the entire reel the appearance of being molded out of liquid metal from Terminator 2. There are very few sharp edges on this reel. Instead, the 18 Stella features elegant, rounded contours that give the entire reel the appearance of being molded out of liquid metal from Terminator 2. Turn the reel's handle and you'd almost swear the internal mechanisms of this reel were entirely electrical or some other sort of wizardry. The micro-gear mesh of the Stella's gears are the very definition of high end. The term "smooth" is not sufficient enough to describe this new Stella's operation. I could not wait to get this work of art out on the water. Real World Tests: I could not wait to get this work of art out on the water, but first there were some decisions to made. You can't just spool up a reel like this with any type of fishing line, and you cannot pair it with just any fishing rod. 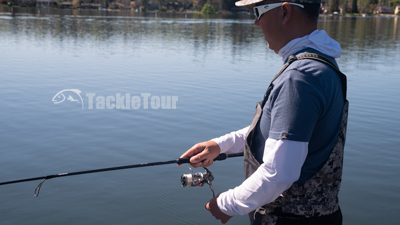 Both decisions have to be carefully considered and while the choice in line came rather quickly (Seaguar Tatsu in 4lb test), the decision in the right fishing rod was more of an audition process. I paired the Stella C3000MHG with three different sticks - my Daiwa Steez AGS spinning rod, Phenix's K2 T713, and finally a G.Loomis DSR820S GLX. Spooled with 4lb Seaguar Tatsu FC. 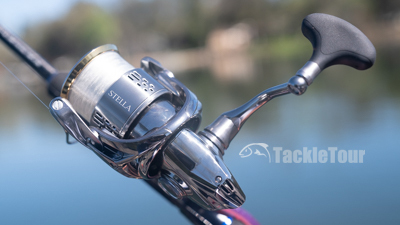 Retrieve: I kind of already spoiled the news on this aspect of Shimano's Stella FJ. Of course, that was the reel's out of the box impression. 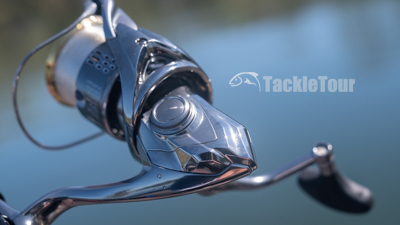 Out on the water, with your line already laying out across the top of the water, clicking the bail over, grasping that soft rubber, T-knob at the end of the liquid metal handle, and rotating it in a counter clockwise direction, the reel shows you it is ready to go to work. That ultra-smooth, out of the box experience is repeated on the water. There are all kinds of technology buzzwords Shimano uses to describe the engineering behind this reel like Micro-Module Gear II, X-Ship, Silent Drive, etc.. Admittedly, I did not have the nerve to open this reel up and inspect all these buzzwords. 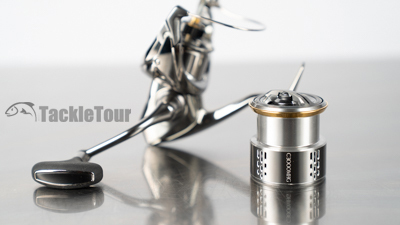 Shimano always states that if and when you open a spinning reel up, the gear alignment on re-assembly is crucial. This reel is so perfect during retrieve, that I did not want to risk spoiling how well it worked. 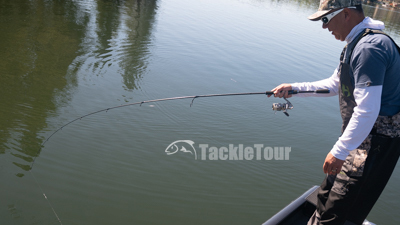 That ultra-smooth, out of the box experience is repeated on the water in real world conditions adding to the sensitivity of your overall combo because there are no extraneous noises, vibrations, knocks, pings, to distract you from feeling the slightest little "tick" or obscure pressure on your line. The Stella's drag consists of two three felt washers sandwiched by aluminum washers (one keyed).